To attain optimized control functionality in the ECU numerous parameter values need to be modified. They include scalar values as well as characteristic curves and maps. You can use CANape to make user-friendly modifications to modify ECU behavior, either manually in the various calibration windows or automatically by using scripts and functions. Process the same data sets jointly within a team. Built-in integration to connect CANape users to vCDM. vCDM provides a scalable solution that delivers high productivity for individual calibration engineers, small teams or the complete enterprise. This covers all requirements for process assurance, data quality and variants management. Electronic control units in all domains (Powertrain, Chassis, Body) contain numerous calibration and configuration parameters. The correct data for each controller in every vehicle variant is equally important as high quality software code in the ECU. The complexity exceeds the capabilities of generic tools such as version control software or simple spreadsheets. The professional management of calibration & configuration parameters with vCDM empowers you to maintain high quality calibration data with consistency across each variant. Our solution enables you to track every single change, monitor project progress and maturity of calibration data. vCDM provides a scalable solution that delivers high productivity for individual calibration engineers, small teams or the complete enterprise. The efficient management of the calibration process across teams and organizational barriers is a key success factor. vCDM enables you to quickly set-up a structured process with clear tasks and responsibilities that supports each element of a calibration project – project creation, calibration data delivery, calibration integration and software changes. vCDM enables you to define calibration work-packages and assign parameter permissions to groups and single engineering. Conflict in compiling calibration results can thus be avoided, before they occur. A direct integration with MCD tools such as INCA and CANape provides a seamless exchange of calibration results from the desktop to the central database. vCDM provides productivity increases by supporting powertrain use-cases such as OBD Diagnostic Function-Inhibitions and custom HEX-file generation. 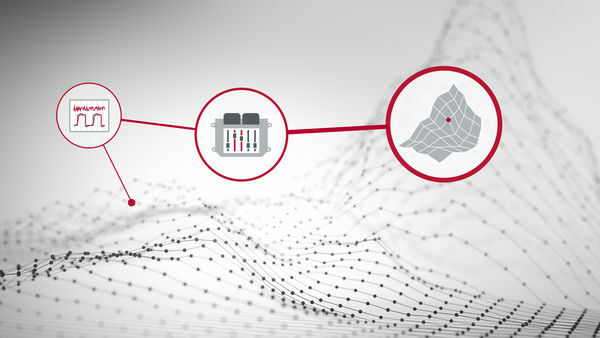 Unlike powertrain – with a clear separation between software development and ECU calibration and its post-build calibration methodology – many other areas of electronic controls rely on a close integration of calibration and configuration with software development. Calibration projects can be managed just on the parameters with no HEX-file required. ASAP2 Tool-Set supports creating ECU description files in A2L format. Software-centric calibration requires flexibility and interfaces to easily interchange calibration results from MCD-Tools to Simulink-models and code-generation. vCDM ensures that calibration data is seamlessly transferred from automotive data formats into MATLAB format, and return. vCDM and CANape support calibration approaches by simulations, including Simulink models and measurement data files and it allows the integration of calibration data management with Application Lifecycle management (ALM) systems. The complete visibility of every calibration change throughout process helps you to meet your ISO, SPICE or CMMI quality goals and deliver excellence. The productivity of a calibration engineer is vitally important for the success of calibration data management. vCDMstudio is a powerful application that simplifies calibration data processing. It connects calibration data from the desktop into the central vCDM database. vCDMstudio is closely integrated with CANape and can be used with any other MCD tool, such as INCA. It provides powerful off-line calibration capabilities to every calibration engineer. Working with calibration data sets for copy, compare and merge becomes as easy as Excel, but with all functions required for automotive data (A2L, DCM, Paco, CDF, HEX). vCDMstudio enables you to quickly introduce calibration data management for teams. It is available as standalone solution and it enables you to expand your capabilities by upgrading to vCDM, thus protecting your investments. Calibrating the ECUs requires team work. Continuous exchange and continual integration of preliminary results increases efficiency and reliability. A calibration data management system like vCDM coordinates collaboration in large teams distributed across the globe. vCDM comprises many functions for organizing working positions and for rights and variant management. The system was designed to be open, in order to support various data sources and tools. The full range of vCDM's functions is not necessary for many collaboration models, however. The CANape vCDM option gives many users the functionality they need in order to work with vCDM. The workflows have been optimized for calibration engineers and are fully integrated in the CANape user interface. In addition, CANape vCDM provides a simple model for collaboration in small and mid-sized teams. Visibility, up-to-date information and quality management are key to successful calibration data management. vCDM helps you to control the process by powerful reporting and analysis. It delivers all desired information to desktops, webpages or printed reports. Automated emails and exports to Excel help to distribute status and work packages. vCDM enables you to manage your team by roles and responsibilities and assists by flexible workflows. Setting up work packages and parameter permissions help to avoid conflicts before they arise. Browsing and data-mining through previous calibration projects enable you to generate high-quality base calibration for new projects. The built-in programming interfaces enable a close integration of data management in your existing processes. Generating HEX files with up-to-date calibration and automated transfers into product life cycle solutions support a seamless tool chain. Vector offers services to customize vCDM for our customers to ensure best-fit solutions. In ECU development, short innovation cycles and high cost pressure lead to a distribution of work, in which the software development process is separate from the process of adapting it to its desired behavior in the vehicle. In today's vehicles, tens of thousands of such calibration data values must be determined and managed and indeed for each individual vehicle variant. To avoid errors, quality standards are needed that have the same level as in the development of the actual software. This article discusses the requirements of tools for managing parameter values and presents a universal solution.